Though Perugia is in the modern Italian province of Umbria, its urban origin is Etruscan, a civilization/culture that flourished in central Italy (with expansions to the north and south) from the eighth-third centuries B.C., in concert with an explosion of trade opportunities with Greek and Phoenician sailors and settlers (and the growing city-state of Rome that eventually swallowed them all). The Arco Etrusco on the north side of Perugia (rebuilt in the [Roman] Augustan period) evidences the architectural ambitions of the town (basically, everything below the spring of the lower arch is Etruscan masonry). There is plenty of argument about the Etruscans on all fronts, but one of the most stubborn issues concerns whether the ‘Etruscans’ were migrants to Italy (their language is non Indo-European) or developed locally from what is known archaeologically as the ‘Villanovan‘ culture. A few days ago a colleague sent around a 2007 story from the New York Times about the origins of the Etruscans, and how DNA evidence had corroborated the story in Herodotus’ Histories about the Etruscans coming from Anatolia. Here is that Times article. The customs of the Lydians are like those of the Greeks, except that they make prostitutes of their female children. They were the first men whom we know who coined and used gold and silver currency; and they were the first to sell by retail. And, according to what they themselves say, the games now in use among them and the Greeks were invented by the Lydians: these, they say, were invented among them at the time when they colonized Tyrrhenia. This is their story:  In the reign of Atys son of Manes there was great scarcity of food in all Lydia. For a while the Lydians bore this with what patience they could; presently, when the famine did not abate, they looked for remedies, and different plans were devised by different men. Then it was that they invented the games of dice and knuckle-bones and ball and all other forms of game except dice, which the Lydians do not claim to have discovered. Then, using their discovery to lighten the famine, every other day they would play for the whole day, so that they would not have to look for food, and the next day they quit their play and ate. This was their way of life for eighteen years. But the famine did not cease to trouble them, and instead afflicted them even more. At last their king divided the people into two groups, and made them draw lots, so that the one group should remain and the other leave the country; he himself was to be the head of those who drew the lot to remain there, and his son, whose name was Tyrrhenus, of those who departed. Then the one group, having drawn the lot, left the country and came down to Smyrna and built ships, in which they loaded all their goods that could be transported aboard ship, and sailed away to seek a livelihood and a country; until at last, after sojourning with one people after another, they came to the Ombrici, where they founded cities and have lived ever since. They no longer called themselves Lydians, but Tyrrhenians, after the name of the king’s son who had led them there. (I.94.1-7; Godley’s 1920 translation from the Perseus website; here’s the original Greek). My own digression: one of the fun things in this passage is that Herodotus says the Lydians came to the Ombrici ( Ὀμβρικούς), that is, the Umbrians. Ombrikos in Greek is an adjective meaning ‘raining’; Umbria is the Latinization. There’s also a play on words; in Latin, umbra, -ae means ‘shadow’ or ‘shade’ (hence the title of this blog). An umbrella is a small shade that protects one from rain! Finally, an extended meaning of umbra (as in English) is ‘ghost’, since the dead naturally occupy shadowy places. In a sense, then, one reading of our blog title is: ‘ghosts’ of Umbria. As an archaeologist, I like that. Archaeology is undergoing a revolution with DNA. For decades, our method of grouping and assigning identities has relied primarily on the formal and functional characteristics of art and artifacts. If two objects share similarities, then the ideas or processes or actual people that led to the production of those objects may well be shared, which could mean cultural affinity. If those objects are found far apart in space and/or time, then questions can be raised (assuming the objects are in fact related) about whether concepts, artists, objects, or people moved from one place to another over that period of time. This is the heart of all arguments about whether cultural change happens through diffusion or local development. These scholarly arguments are significantly affected by contemporary political contexts; during the colonial and post-colonial Cold War periods, diffusion was relatively popular. With the break-up of empires and establishment of new nations and archaeological services that wanted to promote their own political and/or ethnic identities–understandably to root and rationalize their autonomy and authority–local development became the prevalent trend (an extreme and egregious example is ‘pyramids’ in Bosnia). Further complicating all this is the fact that a small group of elites can come into an area and significantly alter the cultural, religious, social, political, and economic landscape: e.g. conquistadors in Mexico. Or that layers of contact and/or immigration can alter a local society in complex ways. Simply put, any simple answer is probably too simplistic. It is good to keep this in mind when considering two approaches (ancient literary text and modern DNA analyses) that seem to proffer a tempting ‘simple answer’. Because of Herodotus’ account, the narrative of Etruscan origins tended to privilege an Eastern beginning among ancient scholars well into the twentieth century, when more extensive excavations in northern Italy stretching back into the Late Bronze Age began to show strong continuity in material culture from ‘Villanovan’ settlements to Etruscan towns. Local origins have since been the dominant narrative. A DNA study of modern Tuscan village populations by Achilli, Olivieri, et al., published in 2007 and publicized around the world (hence the NYT article) shook things up. 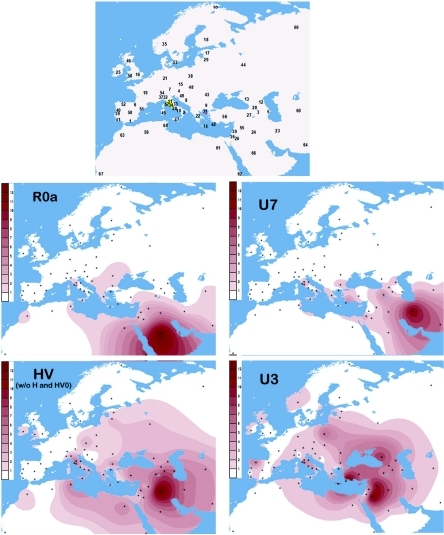 That study appears here: “Mitochondrial DNA Variation of Modern Tuscans Supports the Near Eastern Origin of Etruscans,” American Journal of Human Genetics 80.4 (2007) 759-68. This study discovered that modern residents of Murlo, a small town with significant archaeological evidence for Etruscan urban development in the area (see the ongoing excavations at Poggio Civitate), had a particularly high frequency of mtDNA haplogroups from the Near East. The authors concluded that the evidence supported the scenario of a post-Neolithic genetic contribution to the ancient population of Tuscany. Suddenly Herodotus was back in fashion, though reconciling his specific origin story (Lydians) with much broader DNA indicators (various ‘Near Eastern’ populations) was problematic. There was also the question of when Near Eastern genetic material came into the Italian picture, which is harder to pin down in DNA studies, but absolutely critical to the historical argument. In the same year, a genetic study of cattle suggested bovine importation might have accompanied the new arrivals: Pellecchia and Negrini et al., “The mystery of Etruscan origins novel clues from Bos taurus mitochondrial DNA,” Proceedings of the Royal Society Biological Sciences 274.1614 (2007) 1175-79, but its time window of 6400 to 1600 years ago was too broad to be historically useful. Six years is effectively a generation in archaeogenetics, given the pace of technical development. We now have a new study: Girotto, Tassi, et al., “Origins and Evolution of the Etruscans’ mtDNA,” PLoS ONE 8.2 (2013) e55519. This study compares mtDNA from Etruscan and medieval cemeteries with modern populations, does not assume (like the previous study) that modern Tuscans are descendants of ancient Etruscans, and has more robust controls in place for the comparative analysis of the data. Their findings? Any input of Near Eastern DNA into the ancient Etruscan population arrived before 5300 years ago, well within the Neolithic period, and far before the Iron Age to have anything to do with Herodotus’ story. Also: the modern Murlo DNA did not well represent continuation of ancient Etruscan DNA (contrary to the assumption of the 2007 study). So at the moment, acknowledging a contribution of Near Eastern DNA in a European population (not surprising given the [diffusionist!] spread of Neolithic technologies and materials), Herodotus’ migration story from Lydia to Etruria/Umbria does not seem to have reasonable support from archaeogenetic research. Though of course, the argument is likely to continue. We’re just happy to find ourselves in the position of being at least temporary immigrants to an Umbrian town.